S4K Toddler Tennis is our 45 minute parent and toddler class that is aimed at children from 18 months to 3 years with a focus on providing a fun, engaging and skill-based introduction to tennis. Toddlers are taught the mini and micro motor skills that form the basis of the primary tennis strokes – forehand, backhand, volley and serve. Using the Montessori teaching method and the analogous learning recommended by child psychologists, S4K Tennis is an energetic, fun-filled first step into sport for toddlers. S4K Toddler Tennis aims to steadily build your toddler’s hand-eye coordination before introducing unique pieces of equipment that allow your child to build their capabilities slowly and at a pace that suits them. The S4K Practice@Home book creates a common language between parents, children and coaches and allows parents to practice the skills from the class at home. Practicing outside of the class means that toddlers settle into their new environment faster, build a bond with their coach and start on the journey to developing a passion for sport and a healthy lifestyle. Ultimately, it is key to building confidence. Our Toddler Tennis group take part in games and activities that can vary from being aboard a pirate ship to playing the part of a superhero and all games include a skill focus, which is cleverly wrapped in entertainment. Our tennis program is based on the analysis of techniques executed by the Big 5 Tennis Stars – Federer, Nadal, Murray, Djokavic and Warwinka. 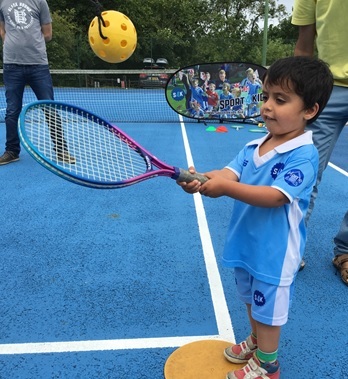 S4K Toddler Tennis is the start of this journey and all children have the opportunity to develop a new skill each month and put this into practice when they score points over the mini tennis nets using our tailored equipment and rackets. Once children have graduated through our Toddler Tennis program, they enter our Diddi Tennis (3 to 5 years) group.